"Hand Shake Problem" is a very common question in many competitive exams such as CSIR in the Aptitude part questions. Here we are discussing a simple formula for answering this question. The csirhrdg has announced the notification of Exam to be held on June 2019. Here biologyexams4u team prepares a 10 minute short video on exam pattern with a solved sample question from part A, B and C. Get familiar with the question pattern and also sharing some tips and tricks for answering questions from my experience. "Don't stop when you are tired, stop when you are done"
Thank you so much for your support. Send your comments to make our free resources better. Definitely, we are preparing with you in chasing your dream. For Results Click this link CSIR UGC NET LIfe sciences result Dec 2018. CSIR will hold the Joint CSIR-UGC Test on 17th June, 2019 for determining the eligibility of the Indian National candidates for the award of Junior Research Fellowships (JRF) and for determining eligibility for appointment of Lecturers (NET) in certain subject areas falling under the faculty of Science & Technology. The award of Junior Research Fellowship (JRF) to the successful eligible candidates will depend on their finding admission/placement in a university/ national laboratory/ institution of higher learning and research, as applicable. 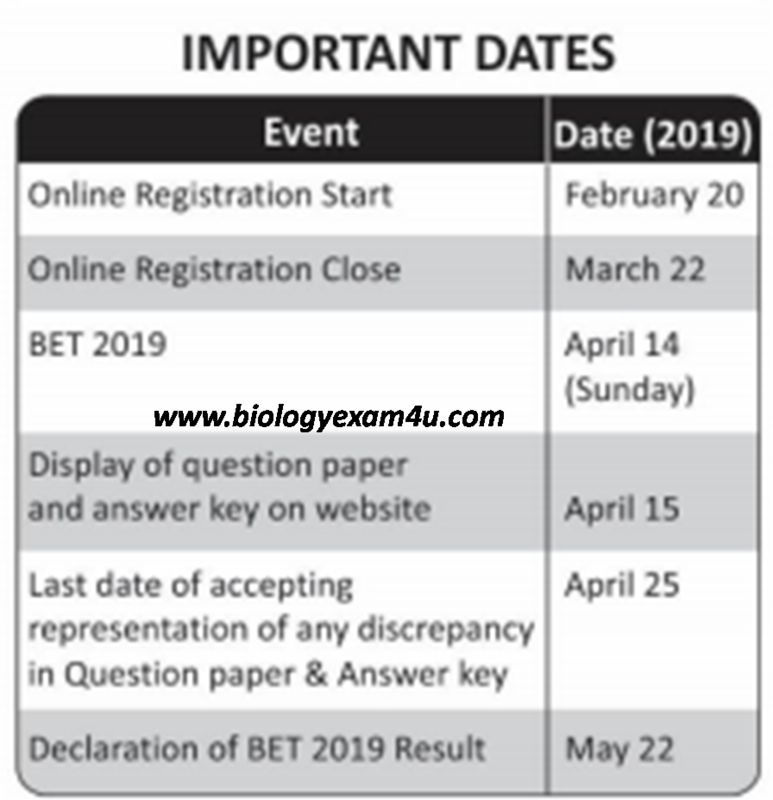 Exam Date: CSIR-UGC JRF NET :16th June, 2019. 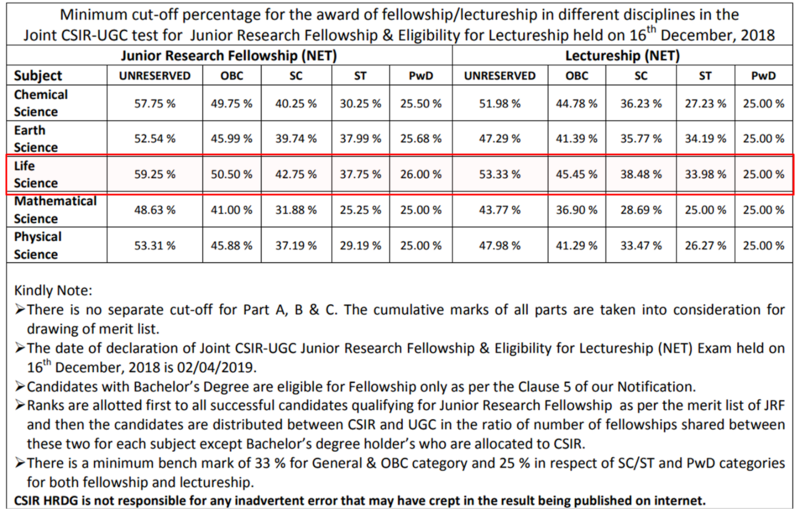 For Junior Research Fellowships (JRF):Maximum 28 years as on 01-01-2019 (upper age limit may be relaxed up to 5 years in case of candidates belonging to SC/ST/OBC, Physically handicapped/Visually handicapped and female applicants). avail the fellowship from the effective date of award. The eligibility for lectureship of NET qualified candidates will be subject to fulfilling the criteria laid down by UGC. PhD degree holders who have passed Master’s degree prior to 19th September 1991, with at least 50% marks are eligible to apply for Lectureship only. Part 'A' shall be common to all subjects including Engineering Sciences. This part shall contain questions pertaining to General Aptitude with emphasis on logical reasoning, graphical analysis, analytical and numerical ability, quantitative comparison, series formation, puzzles etc. 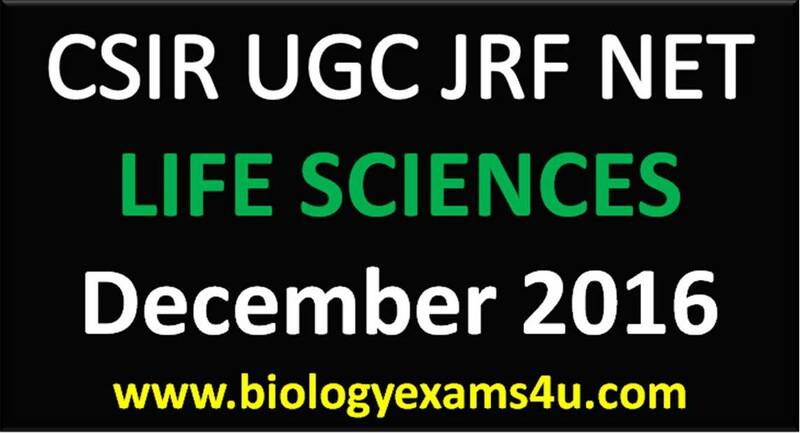 How to prepare for CSIR UGC NET JRF Life Science Exam ? Examination Centres: Bangalore, Bhavnagar, Bhopal, Bhubaneshwar, Chandigarh, Chennai, Cochin, Delhi, Guntur, Guwahati, Hyderabad, Imphal, Jammu, Jamshedpur, Karaikudi, Kolkata, Lucknow, Nagpur, Pilani, Pune, Raipur, Roorkee, Srinagar, Thiruvananthapuram, Udaipur and Varanasi. Biotech Students Don’t miss this exam! DBT JRF program was initiated in 2004 to provide fellowships for biotech students pursuing research in universities and / or research institutions in the country. Students are selected through online Biotechnology Eligibility Test (BET). 275 fellowships can be awarded every year. Applications are invited from Indian nationals for the award of “DBT-Junior Research Fellowship” (DBT-JRF) for pursuing research in frontier areas of Biotechnology and Applied Biology. JRFs will be selected according to merit under two categories: Category I & II. Category I fellowship (Top 275 in number) are tenable in any University/Institute in India where the students can register for Ph.D.
Category II students (100 in number) will be eligible to join any DBT sponsored Project and avail fellowship equivalent to NET/GATE qualifications as per DST Guidelines, subject to selection through institutional selection process. Fellowship will be co-terminus with the duration of project and institutional rules will be applicable. There will be no binding on PIs of DBT sponsored projects to select JRF/SRF for their projects from category II list. Selection in Category II will not entitle student for any fellowship from DBT-JRF program. For further details please visit Notification . Eligibility: Students with M.Sc. / M.Tech / M.V.Sc. degree with Biotechnology in title of degree e.g. Biotechnology, specialization such as Agricultural, Animal / Veterinary, Medical, Marine, Industrial, Environmental, Pharmaceutical, Food, Bio-resources Biotechnology, “Biochemical Engineering, Bio-sciences and Biotechnology, Bioinformatics” and M.Sc. “Molecular & Human Genetics” and M.Sc. “Neuroscience” as well as B.Tech / B.E. in Biotechnology (4-year course after 10+2) recognized by UGC/AICTE are eligible for this examination. Remember: For lectureship eligibility still you have to qualify NET. Candidates with minimum 60% for general and OBC category (55% for SC/ST/PH) of the total marks (equivalent grade) are only eligible. For further details and to apply online please visit the URL Apply Online . Date for date of examination is 14 th April, 2019. DBT-BET (category I) entitles a candidate for fellowship subject to Ph.D registration of the candidate in a recognized university or Institute in the country within 2 years. At present, very few institutes or universities allow B.Tech students to register for Ph.D. directly. Registration for Ph.D is candidate’s responsibility and NCCS or DBT have no role in this. Fellowship: The fellowship will be initially for a period of 3 years extendable for 2 more years based on performance. By the end of 2nd year, the performance of JRF will be assessed and will be upgraded to SRF. The fellowship for JRF/SRF will be @ Rs. 25,000/- or 28,000/- per month + HRA as per DST guidelines and research contingency of Rs. 30,000/- per year. 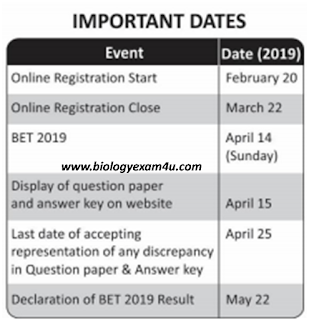 Mode of selection: The candidates will be selected based on an online admission test, “Biotechnology Eligibility Test” (BET) to be conducted on 14th April, 2019 at 10.00 am-1.00 pm.
" Wishing the very Best "
Biology Exams 4 U is preparing with U for your exam. Keep Visiting …………………. 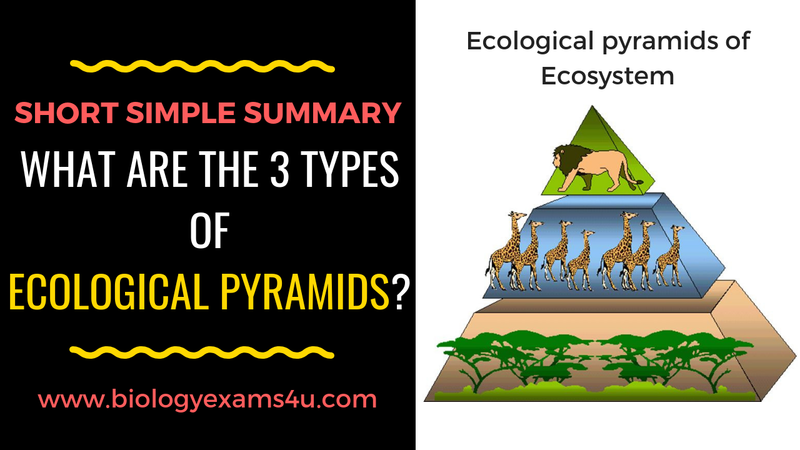 An ecological pyramid is a graphical representation designed to show the number, biomass and energy at each trophic levels of an ecosystem. The pyramid of number is a graphical representation to show the number of organisms at each trophic levels of an ecosystem. The number of individuals at the trophic level decreases from the producer level to the top carnivores. Therefore, the base of the pyramid is broad and apex is pointed. The number of producers is high followed by herbivores then small number of carnivores. The pyramid of biomass is a graphical representation designed to show the biomass of organisms at each trophic levels of an ecosystem. b) Inverted Pyramid of Biomass: In pond ecosystem, the biomass of phytoplankton is very low compared to zoo plankton which is lower than small fishes and large fishes. The biomass increases from the producer level to the top carnivores. Therefore the base of the pyramid is pointed and apex is broad. A graphical representation of the energy level and energy flow in different trophic levels of an ecosystem. At each trophic level, 80-90% of energy is lost. Energy flow is always uni-directional. Maximum amount of energy is available for producer. A typical collagen molecule is long, stiff, extracellular structure in which three polypeptides are wound around one another in a rope like triple helix. The chains are held together by hydrogen bonds. 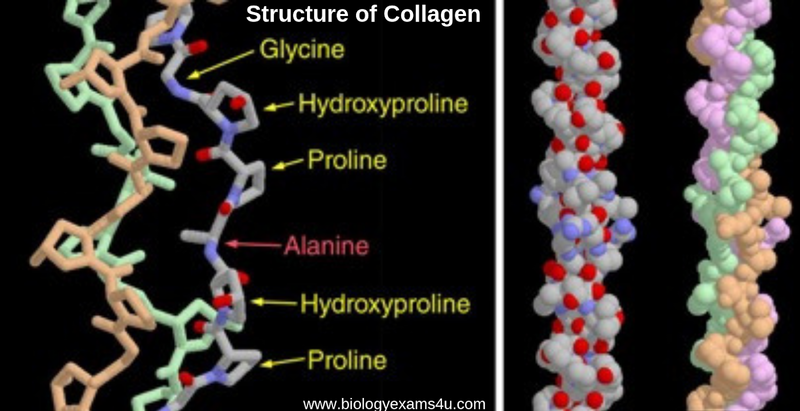 Variations in the amino acid sequence of the alpha chain result in collagen molecules with slightly different properties. Type I,II and III collagens are fibrillar, a and are found in skin, tendon, bone cornea and blood vessels. Type IX and XII are fibril associated and are found in cartilage, tendon and ligaments. Type IV and VII from networks in basement membrane and beneath stratified squamous epithelia. Collagen is rich in glycine and proline. The glycine residues are part of a repeating sequence-Gly-X-Y-where X is frequently proline and Y is often hydroxyproline and hydroxyllysine. Hydroxyproline and hydroxyline result from the hydroxylation by specific hydroxylases of proline and lysine residues after their incorporation into alpha chains. The enzymes require ascorbic acid as a cofactor. The hydroxyl group of the hydroxylysine residues of collagen may be enzymatically glycosylated. The precursors of collagen alpha chains are formed in fibroblasts, osteoblasts and chondrobalsts, and travel via the endoplasmic reticulam and Golgi to the extracellular matrix. There, the N terminal and C terminal properties are removed by procollagen peptides. In some collagen, the collagen molecules self assemble into fibrils in which the adjacent triple helices are arranged in a staged pattern, each overlap ping its neighbor by a length approximately three quarters of a molecules. The triple helices are then cross linked, giving the fibrillar array great tensile strength. Ehlers Danloas syndrome is a heterogenous group of generalized tissue disorders that result from inheritable defects in the metabolism of fibrillar collagen molecules. Symptoms can include stretchy skin, loose joints and vascular problems. 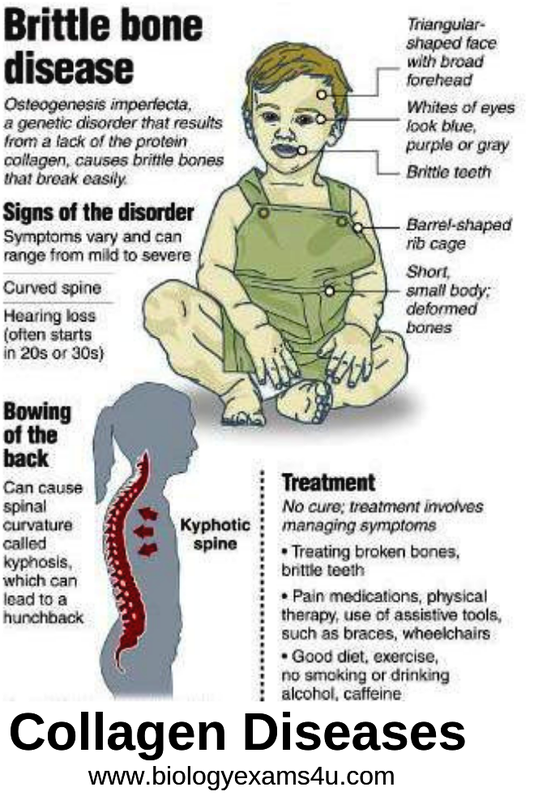 Osteogenesis imperfecta, also known as brittle bone syndrome is also a heterogenous group of inherited disorders involving mutations in the collagen genes themselves that is distinguished by bone that easily bend and fracture. 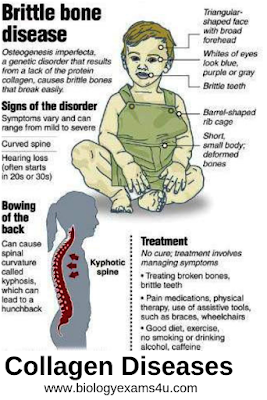 Retarded wound healing and a rotated and twisted spine, leading to a humped back appearance, are common features of the disease. Lathyrism - sweet pea contain a chemical beta aminopropionitrate inhibit the lysyl oxidase preventing the cross linking of the tropocollagen molecules.